Nutritional Pathways are the step by step chemical processes of food breakdown within the body & their ultimate conversion to energy. To understand Nutritional Pathways lets, first have a quick relook at some of the basics that have been mentioned in several posts. Apart from water, our diet consists of 3 other macro nutrients – Carbs, Proteins & Fats. The micro nutrients are vitamins and minerals which also have important roles in our body & metabolism. But for now, we’ll only concentrate on Macro nutrients – the C, P & F. All three of them are organic compounds that are composed of carbon, hydrogen & oxygen, except that proteins additionally contain nitrogen. During photosynthesis plants get Carbon & Oxygen from CO2 (Carbon dioxide), Hydrogen from H2O (water) & use the energy from the Sun. These are used to form glucose, starch, fiber, fat or protein. Carbs & Proteins provide 4 cal / gm, where Fats deliver 9 cal /gm. Our source of energy is a substance known as ATP (adenosine triphosphate). All 3 of the macro nutrients can be converted to ATP and provide us energy. Carbs are also known as saccharides (sugars) as all carbs are made up of and eventually break down to glucose. Carbs are found in sugars, starches & fiber. Generally speaking sugars are simple carbs, and starches & fiber are complex carbs. The simple carbs are broken down and convert to glucose much faster than the complex ones. Based on this was born the concept of Glycemic Index (GI) of foods. The GI is a number indicating how fast the carbs in the food convert to glucose, where pure glucose has been given the benchmark 100. All other carbs lie below this number. For diabetics, this is a meaningless number as for them the issue is “how much” glucose converting foods are eaten, and not “when” they will convert to glucose. Proteins are also known as and formed from amino acids. These acid group/s are bound to the central carbon. The body needs 20 different amino acids to function, and 11 of them can be processed within the body itself. That is why these 11 amino acids are classified as “non-essential”. The other 9 “essential” amino acids must be provided by the diet. Amino acids are our building blocks and are re-formed to make more complex protein compounds, which are what we are made up of, as are all the other organisms. So proteins are used in build up & repair but the liver also makes glucose out of protein, just so that the body has ample glucose when required. Since all organisms including bacteria and viruses are made of protein, the brain perceives them as a threat and accords priority to them in the digestive process. As mentioned above proteins contain the additional “Nitro” group, which converts to ammonia/urea & this is excreted in urine by the kidneys. This is another reason that though we are made up of protein, intake of protein must be limited to a certain optimum level only. Fats are made from fatty acids and as can be seen above, are a much denser and compact source of energy. They are classified based upon the degree of saturation of the carbon atoms in the fatty acid. Fatty acids can be Saturated, Mono Unsaturated (MUFA) or Poly Unsaturated (PUFA). They can also be classified based upon the length of their chains, namely short, medium or long. Most of the fats that come from diet are in the form of Triglycerides, where a glycerol molecule is esterified (bonded) to three (tri) fatty acids. Our dietary fats are mostly excreted because they compete for absorption with un-esterified fatty bile acids which the body prefers. The body uses different pathways to breakdown the macro nutrients into a 2 carbon substance known as Acetyl CoA (acetyl coenzyme A). 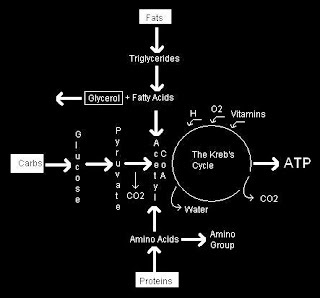 Within our mitochondria (cell’s power plants) the Acetyl CoA enters into a cyclic reaction known as the Kreb’s Cycle or Citric Acid Cycle or Tricarboxylic cycle. See the diagram below for a better understanding. All of the 3 macro nutrients can provide energy but the preferred sources are Carbs or Fats as the conversion of protein to Acetyl CoA itself is a very energy consuming process. Where a unit of glucose provides 32 ATP, the equivalent amount of fatty acid can provide up to 106 ATP. Obviously fats are a denser, compact and better source of energy. Let's now look at the reverse process, the utilization of energy. Glycogen conversion to ATP is very rapid and fast, and hence it is a preferred source, whenever short duration rapid bursts of energy are required. Say in a sprint or during some moments of fast games like squash or tennis or other extreme sports. For long duration sustained exercise like a jog, run, marathon, dancing or rhythmic aerobics fats are the better option. Because they convert to ATP at a gradual slower pace but provide more energy. The storage form of glucose in our body is glycogen. Carbs eventually get converted to glycogen by the liver. On a priority basis, the glycogen is first stored within the liver till it reaches a threshold level - approximately 400-500 gms or a pound. Then it is circulated for uptake and/or storage by the muscles which can be another 3-4 pounds. This is for the muscle’s use, as and when required, during activity. Remember that this is for localized muscle use and not put back into circulation. Beyond this, the glycogen is stored in the adipose (fatty) tissue in the body as fat. This is nature’s selfish way of preserving for the future, just in case. This is the central cause of obesity in the world today. An important fact to be noted is that glycogen when stored, retains water along with it in the ratio of 1 : 16. Therefore a heavy carb meal can push your weight up by about 4 pounds almost overnight and will take 4-7 days to be lost again if diet is well controlled again. The amino acids (proteins) undergo similar fate upon further synthesis. The liver converts some of them into glycogen via a process known as gluconeogenesis. The rest are utilized for repairs and build up. The fatty acids are used up as ATP for energy or may be stored in adipose tissue if in excess. So obviously a high carb + high fat diet can be lethal over time. For optimum health and energy, the trick lies in balancing your diet. If the C : P : F ratio is incorrect, problems of fatigue etc can be seen. I’ve been trying to maintain and recommend a Ketogenic Diet which can be worked out in the following manner. Measure your height in cms and deduct 100. Let’s say your height is 5’-1” which is 61 inches, which is 155 cms. So your ideal protein consumption for the day would be 55 gms. Half of this (28 gms) should be carbs and 3 to 3.5 times fat, which is around 175 gms. If you can follow this for 2 weeks through the induction phase, you will begin to notice a few changes in your self. The first will be weight loss, the second will be an increase in energy, the third will be an acetone type of smell in your breath. This is because, you are now using ketones for energy. Plus your health parameters will slowly become text book fantastic. When choosing carbs try and stay away from simple carbs like sugars (incl fruits if diabetic) and refined (factory made) carbs and stick to a lot of the complex ones like vegetables (esp greens). Lentils, some rice and wheat should be fine if you are non-diabetic and can source well. It is amazing that the body’s preference for non veg sources of nourishment is inbuilt as it utilizes these nutrients to the maximum while only taking in one third to a half of the nutrition vegetarian food has to offer. I wonder why ?